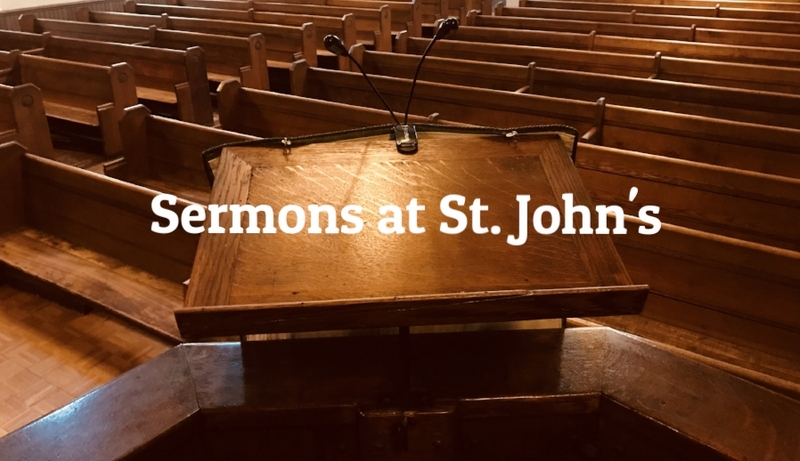 Check back regularly for audio and text versions of sermons from services at St. John's. Part of growing mature in our faith is learning how to hold tensions, learning how to hold two truths that conflict with one, or at least pull in opposite directions. Our readings this Sunday morning express that tension, that many of you, and I can speak about myself, I feel. Oh, to have Jesus in the boat! Oh, to have Jesus in the boat and just have to nudge him awake for the storm to calm! Because we live in stormy times. If only it were so. And there’s truth in that. I’ve certainly been in seasons of my life when I wanted that to take place, when things were just insane, and then peace, calm, hope broke in. Maybe you’ve had that experience too. It’s a reality of our life in faith. But on the other side of this tension is the desire to be the one that makes the difference, to be the one to throw the stone that takes brings down the giant. To do something that makes a real difference in the lives of people we love. Our faith encourages that too. Paul describes the call to be active in our faith, to have weapons of righteousness in our hands, not to do violence, but to bring justice and mercy, to bring God’s ways to the world. We hear a call to be active, not just to be rescued and saved, but we need that too. You see, it’s a tension; both things are true. And when you are in the middle of that tension, and you’re really feeling it, a word from me to you as your priest and pastor. If you feel that need very powerfully for rescue, if you are facing an incredible storm, and you feel overwhelmed, that’s the time to let Jesus come to you, that’s the time to practice patience, that’s the time to leave it in God’s hands, to know that God is faithful and good. When you are churned up inside, that’s not the time to take action. But if you’re feeling like you are ready to go and your cause you know is just, then we can learn some things from this David and Goliath story. Have you heard the story of David and Goliath before? Yeah, you have, this is why the Bible is beloved, this is one of those stories that has gone out into the broader culture and endured. We live in a time when people know the Bible less than they ever did, but they still know some things, and they know David and Goliath. The boy David, the giant Goliath, and the underdog brings down the giant. We can talk about that in all kinds of contexts, but this story is rich in wisdom if we dig into it. It can teach us about how to act in times of trouble, in times that are storm like, overwhelming, and maybe particularly in the times we find ourselves living in today, in this particular political and cultural moment. Let’s look at the story together. We have a battle taking place between the armies of Israel, led by their king Saul, and the Philistines. Now in your experience, if God forbid, you have been in war, as that’s always a terrible experience to have, or what you’ve learned on the course of your life journey, when two armies are facing one another in a battle, are their groups large or small? Right—lots of people. So imagine the scene now, with hundreds, if not thousands, of soldiers arrayed on one side and the other. And into that scene comes Goliath: one person, a big person, but one person. So Goliath is surveying the scene and maybe he thinks the armies of Israel are stronger than the Philistines—maybe he thinks that—because he does something very particular. He does something that you need to watch out for, because certain people like to use this trick. What does he do? Goliath comes out and he says something. Here are all these soldiers, powerful and trained soldiers, and Goliath comes out onto the field of battle and says something--what does he say? “Send one warrior to fight me. And if your warrior wins we will be your servants. But if I win, you’ll be ours.” Does that make any sense at all? If you have a whole army, hundreds or thousands of soldiers by your side, why would you fight one man, even if he’s a giant, one your own? Why would you fight? Because you bought into it. Goliath is making it all about himself, about him. Is a bell going off for you about someone in our culture at this moment who is making it all about himself? It’s what bullies do. Bullies make it all about themselves, and try to get all the focus on them. And then manifest their mastery, once they have your attention focused on them. Goliath makes this appeal, and Saul and all the soldiers of Israel realize it’s all a huge ploy, and resist. Is that how it went? NO, that’s not what happened. Saul and the soldiers feel dismay. Who could possibly defeat Goliath? And they are paralyzed in their fear. That’s remarkable. That moment right there is remarkable. And when people do that, it is so easy to be terrified ourselves, to be mystified. A spell is cast over us, and we think, “Oh, this can never change, this person is too strong, we can never resist, we’re doomed.” Have you heard that? Yeah, I’ve heard that. And he has a little dialogue with Saul, the King, and Saul says, “How could you possibly fight him?” Interestingly enough Saul mentions Goliath’s experiences and David’s youth. “He’s been a warrior for all his life, and you’re a boy …how could you possibly fight him?” That’s a fair question—because if you are a trained warrior you have a set of skills and techniques. David does a wonderful thing in answering Saul. He goes back to what he knows, he grounds himself in his own experience, and then he brings that experience into this new context that he finds himself in. I used to tend the sheep and when I did and a lion or a bear would come to take one of the sheep I would fight it and get my sheep back. And if the lion or bear turned on me, bared his mouth, I would fight the bear or lion to protect myself. I can fight this Goliath. When we are in those times of realizing that something awful is unfolding and we are overwhelmed, and we want to take action, we need to be grounded in what we already know, and take that and apply it in the new context. We need to stay grounded, we need to stay our individual selves, not get caught up in the mob mentality. We need to be grounded in what we know, and feel confident in that and bring this to the new context. Well Saul wants to see David succeed, and knowing that Goliath is a great warrior with armor and weapons, he says, “Here, take mine, take my armor, take my weapons,” which surely are the best Israel had because Saul was the King. And David puts it on, and what happens? He feels ready to go? No, he says, “ I can’t move in this thing!” What is this? The counterpart of being grounded in our own experience is to not take on other people’s experience and try to make it our own. David is wise in his body. He kind of knows what will work and what will not. (And in his own time he wears armor and carries a sword—in years down the road he will be a tremendous warrior and soldier but he is not there now.) And he knows, if I try to take on Saul’s armor and sword, I’m going to fail. So he tells Saul, I and he goes out and gets stones for his sling, and he gets five stones (we’ll come back to that) So David sets out and Goliath laughs at him. And David says, “Is he trash talking? I may be small, but I’m going to knock your head off!” And he comes close to that! (To be fair.) But he doesn’t boast in himself, he doesn’t boast, he says, “ In the name of the living God I’m going to fight you, and I’m going to win.” He grounds himself in spiritual purpose. If we want to take action in difficult, overwhelming circumstances, we need to be our individual selves, not caught up in the mob mentality. We need to be grounded in what we know, and what we feel confident in, and bring that to the new context. We need to not try and take on what other people have in skills and resources that don’t fit us, and we need to go forward for spiritual purposes, for God’s purposes, for things like love, justice, mercy: high ideals that sill give us the strength we need to be centered and strong in the midst of difficult, challenging circumstances. The fight comes. David charges the line, Goliath charges the line. David reaches into his satchel and pulls out all five stones and throws them at Goliath. No, not what happens. David pulls out one stone and slings it and it’s all he needs. So lets go back to those five stones he took from the river. David, the resources that he has for the moment of the struggle are abundant. They are abundant. He took five stones and only needed o ne. He has all he needs and more. We have all we need and more to face the challenges in our lives and in our culture, if we recognize it. If we recognize it and if we take wisdom from this story and practice it. How do you resist the mob mentality that our culture just thrives upon…so we can get more clicks or views of particular statins? How do you resist that and stay grounded in your own individual understanding? I try to limit the number of news sites that I check and limit the number of hours in a day that I do it. That’s how I practice. Do you have a practice that helps you not get caught up in the blind mob mentality, the 24-hour news cycle that keeps you drawn to the latest outrage? That everyone on the internet is all caught up in? If you don’t, you should. What are your resources in your life that can make a difference? What do you know, what do you have? Maybe you have time to call for political action. Maybe you are very generous in your time and you could accompany someone who is facing an immigration hearing, or go to a march and represent as a citizen your concerns for those who are being oppressed in our time. Maybe you have particular skills that can be manifest- pastoral, legal, whatever. What skills do you have that can lead to action? Also, in the midst of this crazy cultural moment we are in, maybe in your own life you are having a Goliath you have to struggle with. Maybe this is personal for you. I know, I’ve been there. I’ve certainly had personal Goliaths I’ve had to struggle with. And I want to make sure I’m naming that, because if you need this word in that moment that can be hugely helpful. In your own life, how do you resist the emotions that can charge you up when you are anxious or overwhelmed? What can you bring to bear to whatever challenge you are facing to help you take the next step? To both the cultural and personal, this wisdom applies. You have your abundance of resources you are ready to apply. What is not your resource? What just does not feel right? Maybe protesting is not your thing. Being in a march just doesn’t feel right to you. It’s ok. That’s like David in Saul’s armor—it doesn’t fit who you are. But what can you do that’s authentically you? It’s ok to do so me things and not others. In fact that’s healthy and wholesome. That’s why we are a diverse community, just like the different parts of our body. So we can all take up the different parts that need to be a whole. What do you need to say, “Yeah, people may say that’s important but it’s not mine to do. I affirm that in you, because I want you to do what you do well, and not do something that’s not true to you. And that matters because we need things to be done well. You need things done well in your own life. So when you are facing a personal challenge, what is it you need to NOT do, because it’s not who you are? Maybe you learned it from a friend, advice given to you but it doesn’t fit. Put it aside, you don’t have to carry it forward. Turn to what’s true to you. And what is the spiritual ideal that speaks to your heart? What is it about your relationship with God in Christ that fires you up? That sends you charging into the battle line like David facing Goliath? Are you passionate about God’s love for everyone and everything? Are you passionate about justice, how God always sees the oppressed and God’s heart goes out to them and seeks their well-being? Are you passionate about mercy, about how God will take anyone who will turn from the evil they are doing and start to do good, an God will meet that person and help them? What’s the ideal that fires you up? That ideal is your courage for the struggle, your power to head for whatever Goliath you face, and to win the day. We live in challenging times. So did David. So have generations before us. And we face a lot of Goliaths. I think of our struggle to preserve the environment. I think about racial justice, the long journey to see our core sin be addressed with compassion. And Goliaths in our own lives: losses, addictions, struggles that can easily overwhelm us. But in God’s time, in God’s comfort, in God’s care, we go from being rescued in the boat to being the hero in our own spiritual journeys, taking up the tasks that God sets for us to make a difference for ourselves and for our community and the world. So friends, find your stones, keep them handy in your pouch, keep your sling by your side. We’re headed for battle. Amen. If you haven’t, I am certain you know the experience. You have a jar of something you want to open, and no matter how hard you try, THE-LID-WILL-NOT-COME-OFF! What are the things we do when we cannot get a lid off a jar? We take a towel and wrap it around the lid to get a better grip. We hand it off to another person so they can try. We run the lid under hot water if it is metal to get the metal to expand and relieve the tightness around the lip of the jar. We bang the lid against a hard surface to loosen it in places (but be careful! You don’t want to break the jar!). Whatever we do, we come back to grabbing the jar and the lid, and TWISTING-TWISTING-TWISTING-IT’S-NEVER-GOING-TO-OPEN-WHY-DOES-GOD-HATE-ME-I-AM-GOING-STARVE- and then suddenly -POP!- off it comes! The stuck lid theory of change says that it seems like nothing is ever going to be different until suddenly, it is. This is a wonderfully evocative way to describe the change of Easter Sunday - it seems like nothing is ever going to change, and then suddenly, everything is different! If we want to appreciate fully and deeply the power of this morning we need help, we need to connect with the experience our ancestors in the faith first hearing about Easter morning. Our gospel writer, Mark, gives us a very dramatic way to do that. We do not know for a fact, but scholars speculate that Mark’s Gospel, Mark’s telling of the life, ministry, death and resurrection of Jesus of Nazareth, began as an oral telling. That is, it was a story that was shared with others from memory mouth to ear, not written down to be read from hand to eye. So imagine with me we are turning our ears to the sacred storyteller mouth as they share with us of the story of Jesus. We are hearing for the first time of Jesus humbly being baptized in the Jordan River by John the Baptist and receiving the anointing of the Holy Spirit. We hear how Jesus goes into the wilderness to pray and fast and discern what his ministry is as the Anointed One, as the Christ, the Messiah. He comes back from the wilderness and he teaches and heals and liberates. He calls followers to him and empowers them to carry on his ministry. We feeds the hungry and brings those outcast and ashamed from sin into his movement of God’s realm, God’s ways (in traditional language, God’s Kingdom). We hear the story told and we are moved by how this young prophet is making manifest the hope and longing of God’s people for justice and love and reconciliation. We hear with confusion as Jesus tells his closest followers that he is going to die in Jerusalem and rise to new life. We share with Peter his indignation at the very idea and we feel the sting as Jesus rebukes Peter and calls on all of us to take up our cross if we would follow him. We hear the story, and it suddenly, tragically becomes like so many of the painful real world stories we know all too well. Betrayal, arrest, cowardice, violence, the powerful assaulting the powerless, oppression stamping down freedom and liberation. Jesus is tried, handed over to the Romans and crucified. He cries out in agony on the cross and dies. The excitement and hope we felt hearing of his ministry is now dashed. Maybe we feel sadness and loss. Maybe we are simply stunned, in shock as it were. Maybe we feel shame that we dared to hope in the first place when we should know better. When the sabbath was over, Mary Magdalene, and Mary the mother of James, and Salome bought spices, so that they might go and anoint Jesus. And very early on the first day of the week, when the sun had risen, they went to the tomb. They had been saying to one another, “Who will roll away the stone for us from the entrance to the tomb?” When they looked up, they saw that the stone, which was very large, had already been rolled back. As they entered the tomb, they saw a young man, dressed in a white robe, sitting on the right side; and they were alarmed. But he said to them, “Do not be alarmed; you are looking for Jesus of Nazareth, who was crucified. He has been raised; he is not here. Look, there is the place they laid him. But go, tell his disciples and Peter that he is going ahead of you to Galilee; there you will see him, just as he told you.” So they went out and fled from the tomb, for terror and amazement had seized them; and they said nothing to anyone, for they were afraid. Mark presents the Gospel to us as a drama, a drama in which we all have a part, in which you have a part. All the hope and excitement we feel at Easter morning is not meant to be a pleasant comforting fantasy, a rewriting of the tragedy of our lives as if they never happened. The power and hope of Easter morning, the power and hope of the Resurrection is to face tragedy, oppression, violence and evil with love and reconciliation and goodness, and to manifest the truth - that God’s ways give more life than the ways of the world, that love is greater than death, that violence is not the final word, that hope is eternal. In our world today, we hear a steady stream of news that is of violence and oppression, of corruption and exploitation. Generations before us have been struggling to change things for the better, often times fruitlessly and with no visible sign of change. And then it happens. Change comes, the stuck jar lid opens, and the world is a more just and compassionate place. From Seneca Falls to Selma to Stonewall, we know places and stories and people in our world where it seemed like injustice would never end, when it seemed like the jar would never open, and then it did. We are in the midst of such a “stuck-jar-lid” transformation right now, led by the students of Marjory Stoneman Douglas High School in Parkland, Florida. These young people are manifesting a powerful kind of Resurrection in response to the Crucifixion they collectively experienced on February 14, 2018. For many of us, seeing these young people take action is a sign of hope, an affirmation that change is still possible, that justice and peace and love are still coming. But here’s the thing, my friends - hearing and seeing the story unfold is not enough; we need to become part of the story. If we would truly see justice, peace and love flourish in our world, if we would truly be people of the Resurrection, if we would truly be followers of Jesus the Christ, then it is not enough to hear the story told to us. We need to enter into the story, to become a living part of it and to share it others. We need to accept the blessing of hearing and the burden of enacting and retelling the story of the Cross and the Empty Tomb. We retell and re-enact this story of Good Friday Crucifixion and Easter Sunday Resurrection because the work of striving for justice, peace, love and reconciliation is never ending. Progress is generational, conditional, always in need of renewal. You are here this morning not simply to be cheered by the good news of Resurrection, but to become a part of it. Will you play your part in this never-ending, unfolding drama of God’s salvation manifesting the power to bring new life from death and to make all things new? Growing up in New York City, Christmas time was always special. There is a reason so many Christmas movies and television shows are set in New York. When I see one, I feel very privileged that Christmas in New York is part of my childhood memories. I look forward to taking my two boys to New York during this season and sharing it with them when they are older. But I have the means to share one of my strongest memories with them now, thanks to the wonders of On Demand cable television: the video Yule Log. When I was growing up, in New York on Christmas Eve every year, WPIX Channel 11 broadcast for two full hours without commercial interruption the image of a fireplace burning brightly while played the music of the season, both secular and sacred. When I was with my Mom on Christmas Eve, we were a “decorate your Christmas tree on Christmas eve” family. We brought out and tested the strings of lights (with the large colorful bulbs, as Christmas lights should be), unpacked the ornaments and decorated the tree. As we practiced this family tradition, the light of the Yule Log from the television screen glowed and Christmas music filled the room. And once in a few years, we might have some hot chocolate to go along with it all. It’s funny as I think back on it now how so much warmth could be generated by such a fake fire. Yes, a fake fire. Now New York City is a crowded overpopulated little island (yes, I was born in Manhattan so Manhattan is ‘the City’ and the rest is the Boroughs) with apartments piled one on top of another in buildings that reach to the sky. This is not a situation where every home can have a fireplace. So that fake Yule Log on WPIX on Christmas Eve was meeting a real need in our hearts and imaginations even though no logs were actually in our home, no fire was being tended, no smell of burning wood filled our living room. It makes me wonder about the power of things fake and things real. For better and for worse, we live in a time when the question of the power of what is real and what is fake is being called. The use of the pejorative “fake news” by those in power in our country is a break with the norms of our civic discourse. To find our way in the midst of the uncertainty this break in norms generates, we need to ask what is real news and what is fake news. Those in power seem to think that the fact that they say something makes it real news, makes it true and relevant and that when they label something as fake news, that makes it untrue and irrelevant. But friends, saying something does not make it real and labeling something else fake does not make it untrue for us mere mortals, even if we are invested with the power of the presidency. To know when things are fake and things are real requires investigation, study, understanding. In the Christmas story, we have a fruitful example of this. Here is the news of this Christmas night - Mary and Joseph make their way to Bethlehem because the government is taking a census for the purposes of imposing a tax. Mary is close to birthing Jesus, so the trip is very difficult. They come to the town, and because so many others are there for the census, they find no room at the inn. The only place they can find is a stable, and Jesus is born there among the animals. Now what I am about to say I said last year, but still I do not want to shock anyone, so here goes - a significant part of this version of the Christmas story is actually fake news. In this fake news version of the story, Mary and Joseph come to Bethlehem, a town where Joseph has distant relatives, but not one of them takes them in and they cannot purchase from an inn a place of rest where Mary can deliver Jesus into the world. All the inns are sold out, and no one is so moved by their plight to offer their place up to them. The help they receive is the minimal kind - “here, take this unwanted space not good enough for regular people and make due with it.” In this fake news version of the story, there is no kindness, no generosity, no gratitude at the coming of the Christ child into the world. When Luke relates Jesus’s parable of the Good Samaritan, he writes of a public inn where the kind and generous Samaritan leaves the beaten man in the care of the innkeeper (found in Luke 10). This inn in Greek is a “pandocheion,” not a “kataluma.” So back there in Bethlehem in Luke 2, it is not a “pandocheion,” a public inn that Mary and Joseph are excluded from but the guestroom or “prophet’s room” that was a part of a typical home in first century Palestine. Further, homes in first century Palestine typically consisted of three tiers - the guestroom or prophet’s room up top, the family’s main living area in the middle, and on a lower level, the place where animals would be brought in for the night. This lower level included a feedbox or manger built into the structure. So when Mary swaddles Jesus and lays him in the manger, she does so in the hospitality of a crowded home, not cast out in the unwanted space of a public inn’s stable. Family was around Mary, Joseph and Jesus, comforting them, supporting them, celebrating with them, practicing the ancient and holy art of kindness, generosity and gratitude. That is the real news of Christmas. Friends, the things that are real are the things that abide, the values that have been the hallmark of God’s love for us across the centuries, values that mark our faithful response to God’s love - kindness, generosity and gratitude. When we practice kindness, generosity and gratitude, we rejoice in the truth; we do not go around declaring the things we do not like or the things we disagree with as fake. When we practice kindness, generosity and gratitude, we have a humility about ourselves that is gracious and welcoming. When we practice kindness, generosity and gratitude, we are eternally beside Jesus in that manger with Mary and Joseph in the home that welcomed them, and we are blessed by the light of Christ that breaks into our hearts and lives and sets us alight with the love of God. On Christmas morning, as Sage and I and our boys Theo and Zach wake up and share the joy of the day in our home, I will put on our television an On-Demand Yule Log with some Christmas music to fill our living room. I suspect my boys will not pay it much mind, but if they ask (well, if Zachary asks, it will be Christmas miracle because he is only one year old!) I will tell them about my growing up in New York City and what this video Yule Log means to me. Even though it will be fake fire, it will feel very good to share this tradition anew with my children as my Mom shared it with me. But the warmth and light Sage and I will most be tending is the love that God has for us in Christ, a love that has the power to bring warmth and light into our souls, our homes, our communities and our world. With Sage, I will strive to tend kindness, generosity and gratitude in Zach and Theo’s hearts and souls, as well as in our own. That holy warmth and light is not fake in any way at all. It is the most real thing there is. May you find and tend the warmth and light of Christ in your heart and your home and your life all year round. And Merry Christmas!